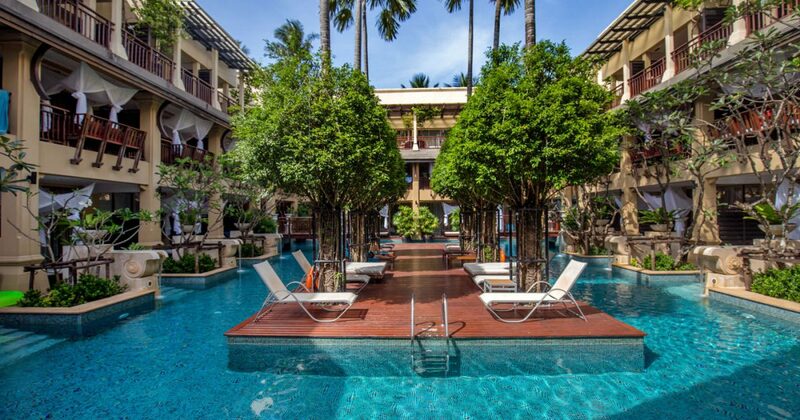 Burasari Phuket has always been a popular hotel, with great features for travellers looking for a really convenient accommodation in Patong Beach. 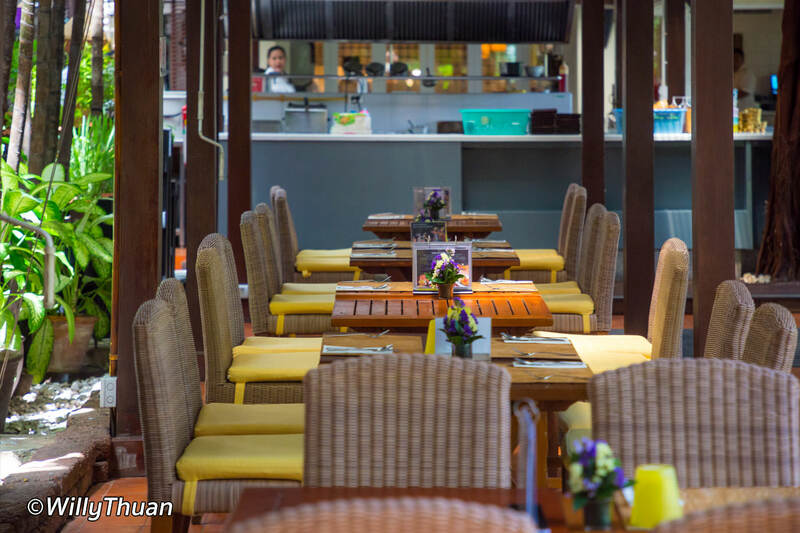 While Burasari doesn’t come with sea view or beach front access, it clearly offers the right balance and great value for money, and the long popularity for this hotel confirms it. We stayed there for a weekend and tried as many things as possible. We came unannounced and paid for our room, meals, drinks and spa treatments. Burasari Phuket is not a beach front hotel but the resort is at a very close distance to the beach, just 100 meters as you can see on the map lower in the page. 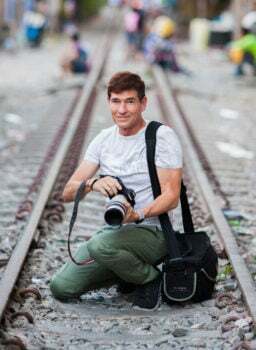 It is also at an acceptable walking distance from the center of Patong and from the famous Bangla Road but stands in a much less hectic part of town. The nearby OTOP night market is also very convenient, popular for a cheap local food and small casual shopping. If you feel like real shopping, Jungceylon shopping mall is not very far either but requires a bit more walk (800 meters). If you feel like it, the famous Hard Rock Cafe and Hooters are just around the corner. 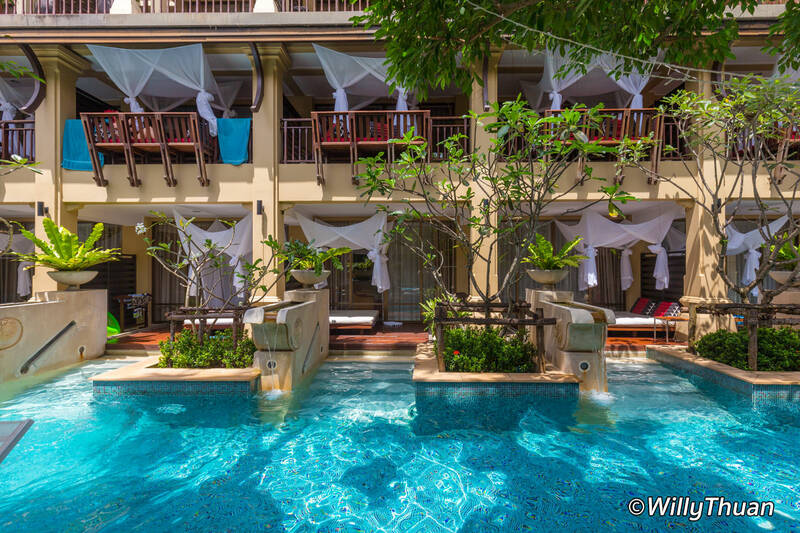 Burasari is a compact resort that makes good use of the available space to accommodate more than 100 rooms, including a set of pool access rooms. The overall design is pleasant, with high trees, lots of plants and lots of shades and 2 pools occupying the center of each wing (there used to be only 1 wing) and a small but welcoming swim-up bar. The restaurant is cozy and the spa very inviting. You’ll find a friendly tour counter inside the resort who will be happy to help you booking almost and tours in Phuket or around. There are 8 room types to choose from. 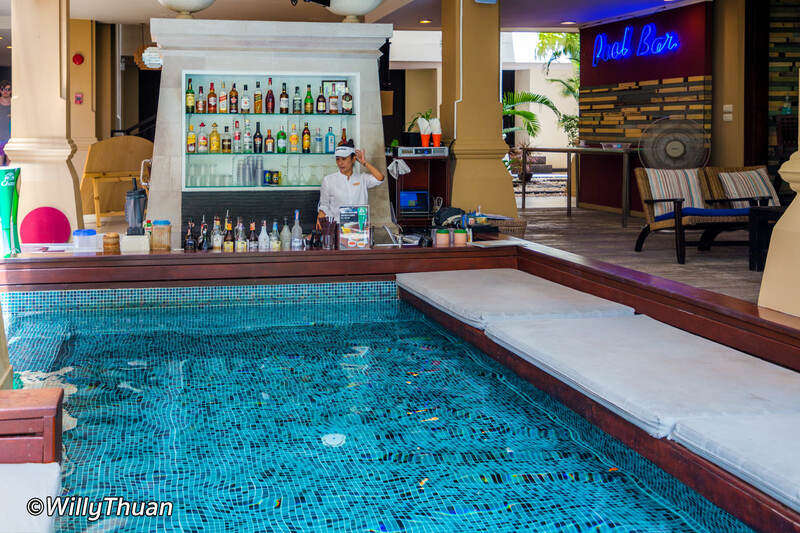 We booked the ‘Elite Pool Access’ for about 5,000 baht, which we found well priced. The room is not very large (40 spm) but feels comfortable with a small sitting area near the bed, a working station and just enough plugs to charge your toys (no USB plugs). 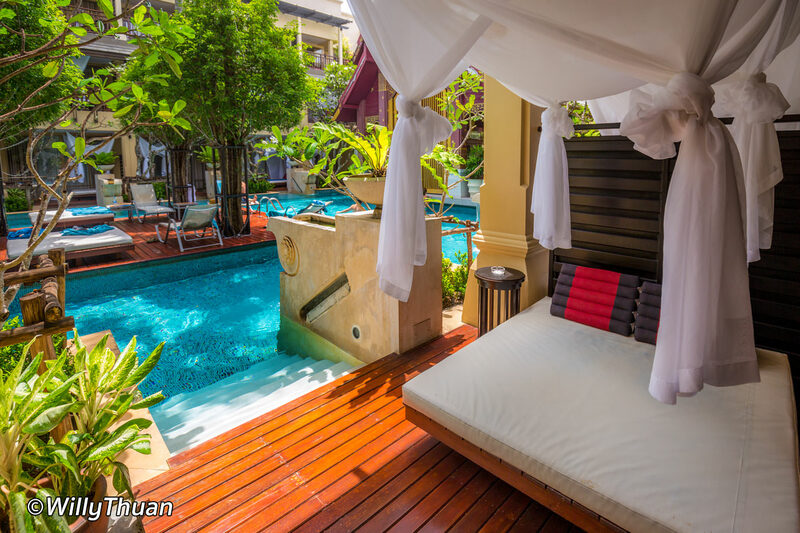 The room opens on a small terrace featuring a large nice day bed with white curtains, lots of plants and a couple of steps to walk directly into the water. The room comes with complimentary mini bar, refilled everyday (beers, soft drinks and water), which is a really nice touch. You’ll find the usual amenities, a 42″ flat screen TV with lots of channels, a safe box, nice bath robes, slippers to go around the hotel, a woven basket with beach towels you can use by the pool or even take to the beach, which is really convenient. The bathtub is large and comfortable, just remember to close your curtains at night as people in the pool will be able to see you. Spa Burasari is surprisingly large, bigger than it seems from the outside and the treatment rooms are beautifully decorated. There are plenty of treatments to choose from and they are able to customize those treatments according to your requests. Spas are a great way to relieve from work stress and jet lag so you should really consider to get a treatment on your first days. Therapists as very skilled and always make sure that pressure, temperature and ambience are right for you. It was a really welcome afternoon break (a camera bag is a lot heavier than you may think). 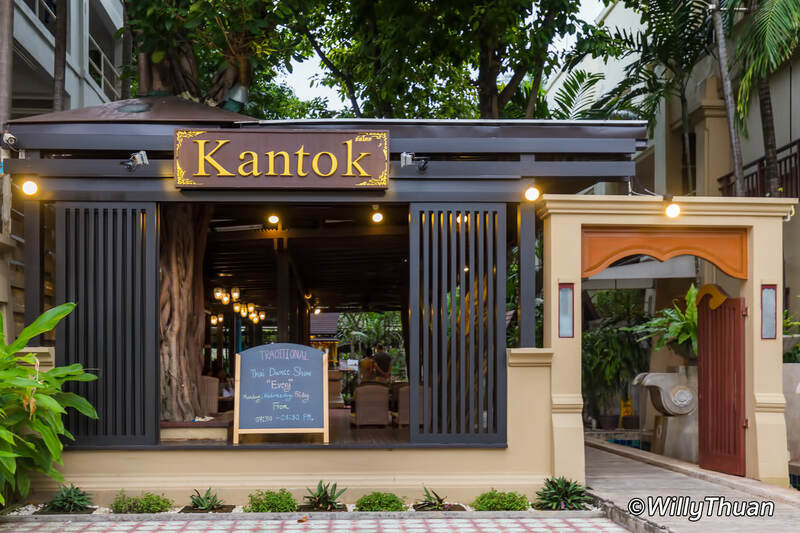 Kantok is the only restaurant at Burasari Resort Phuket, with a nice shady outdoor terrace and an indoor area with air conditioning. 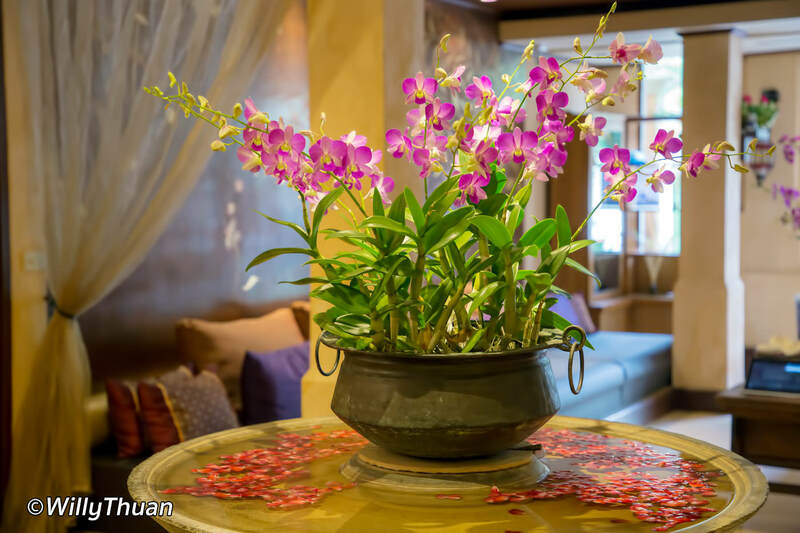 While the restaurant is not very large considering the 100 rooms of the hotel, the layout is attractive with a lot of plants and trees. The breakfast buffet is large with a lot of choice but it can be a little crowded with some waiting time at cooking stations. We also tried the Thai dinner with traditional Thai dance, but better give this one a miss. Maybe it was an unlucky night but we found that 2 cooks for the large amount of guests in the restaurant was surprisingly low. Dishes were slow, the soups were bland and not spicy at all despite our request. The advertised traditional Thai dance was ok and the costumes beautiful, but don’t expect a stage with a non-stop performance. Overall we think Burasari is a great hotel if you want to be near the beach and near the action, but not too close to the action. 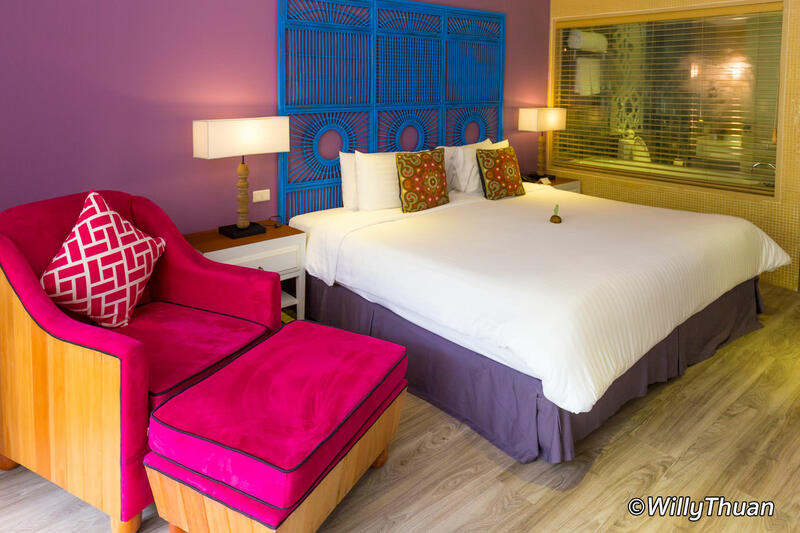 Great design, good spa, comfortable room, very friendly crew and most of all, you get all this at the right price!